I've been twittering lately, hence the lack of blog posts. First bit of news: an award! 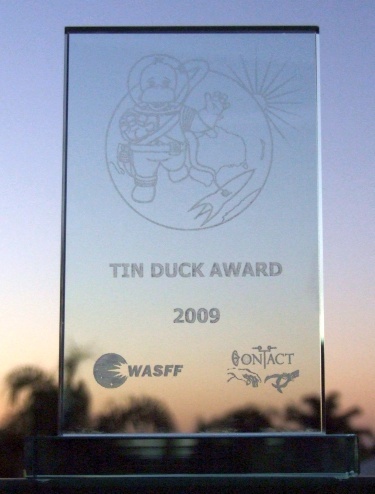 Hal Spacejock No Free Lunch won the WASFF 'Tin Duck' award for best professional long work at Swancon last weekend. This is the second WASFF award in a row for the series, after Hal Spacejock Just Desserts won the same award last year. It's a very handsome trophy, although it was a real pain to photograph because it's solid glass! Second bit of news: Big Media coverage! There was a column in the Weekend Australian on electronic books, and Rosemary Sorensen mentioned the ebook release of Hal Spacejock No Free Lunch. Third bit of news: Still working on Hal Spacejock 5. Congrats Simon! No less than you deserve. It's pretty too.